California Highway Patrol officials are acknowledging that an SUV matching the description of that of a family reported missing was seen completely submerged in a river in Mendocino County the day they were scheduled to show up to a relative's home in San Jose. Responders from the CHP, Southern Humboldt Technical Rescue, and the Piercy and Leggett volunteer fire departments all responded to the report but could not locate the vehicle "due to the strong river current and the poor clarity," CHP officials said. 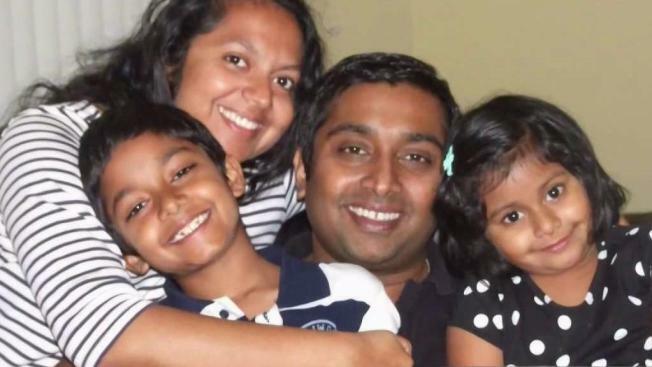 The Thottapilly family, traveling from Portland, Oregon, to Santa Clarita in Southern California, was last seen or heard from on Thursday, San Jose police said. The concerned family member who was expecting the Thottapillys to show up to her home days before called San Jose police on Sunday. At that time, a missing persons report was filed. The CHP's Garberville-area office is redirecting inquiries about the family and their 2016 maroon or burgundy Honda Pilot to its Facebook page, in which has a post about an "unusual incident" in which officers tried to locate the vehicle. At about 1:10 p.m. Friday, the CHP received a report of a car that had gone over the side of a steep embankment on U.S. Highway 101 south of Dora Creek. The CHP sent out a helicopter in an effort to search for the car. On Tuesday, the Garberville CHP established a joint command effort with the Mendocino County Sheriff's Office, Cal Fire, and other agencies to search for the vehicle and its occupants, CHP officials said. "Through the collaborated efforts of all the involved agencies we are working to resolve this incident as quickly and safely as possible," CHP Garberville officials wrote in the Facebook post. "Rescue personnel will be searching the immediate and surrounding areas and constantly evaluating the condition of the river and the weather during the search efforts." The Thottapilly family's disappearance is being investigated by the San Jose Police Department. Anyone with information on the family's location should call 911 or police Detective Michelle Zanato with the Missing Persons Unit at (408) 277-4786. Editor's Notes: The story has been updated to clarify that officials have not located the car that was reportedly seen submerged in a river in Mendocino County.